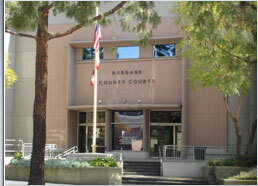 Burbank Court is located at 300 East Olive Avenue, Burbank, CA 91502. The business hours are 8:30 a.m. to 4:30 p.m.
Burbank Criminal Court is in the North Central District of the Los Angeles Superior Court. It handles a multitude of charges, ranging from infractions to felonies. Cases are assigned based on the types of charges and level of severity. More than 1000 felony, 6000 misdemeanor, and 10,000 infraction cases are heard in the Burbank Court each year. Felonies and CHP misdemeanors are prosecuted by the LA District Attorney's Office, and the other misdemeanors and local violations are handled by the Burbank City Prosecutor. Arraignments typically occur at the first court appearance. This is when the judge will inform you of the charges against you, as well as special allegations, and explain your constitutional and statutory rights. You are entitled to have a lawyer present at every court proceeding. Subsequent pretrial hearings at Burbank Court are typically set in misdemeanor criminal cases. This is an opportunity for your lawyer to discuss case solutions with the prosecutor, to determine if there is an opportunity to resolve the case prior to a jury or court trial. A Preliminary Hearing is a procedure set in felony cases. The judge will evaluate testimony and evidence presented by the prosecutor, and make a determination of whether probable cause exists to show that you committed the alleged criminal offenses. Division One is a busy courtroom assigned the most serious charges, including all felonies. This courtroom handles cases initiated in the cities of Burbank and Glendale, including drug, theft, weapon, domestic violence, assault, as well as warrants and probation violations. A typical calendar includes arraignments, Early Disposition Proceedings (EDP), Preliminary Hearings, and progress reviews. Division Two is the busiest courtroom in Burbank. It handles misdemeanor arraignments, pretrial conferences, and trials. A typical day has 50+ cases scheduled, including misdemeanor and infraction violations, as well as 5 to 15 In-Custody misdemeanors. Types of cases include, petty theft, shoplifting, drug possession, driving with a suspended license, hit and run, airport arrests, and Burbank Municipal Code offenses. Non-felony cases ending with the numbers 5, 6, 7, 8, 9, or 0, are set in Division Two. Division Three is a misdemeanor/infraction calendar courtroom, essentially functioning like Division Two, handling about 40% of the misdemeanor/infraction caseload. Non-felony cases ending with numbers 1, 2, 3, or 4, are assigned to Division Three. Department G is an "overflow" courtroom which is assigned various criminal cases depending on need and availability. If your case is a traffic infraction, your case is initially set in the Court Clerk's Office in Room 100. If you have particular requests about the case, or would like to set the case for a Court Trial, your case will be set, as explained above, in either Division Two or Division Three. How do you know if you need an attorney? If you are being charged with a crime you need an attorney. It is never wise to represent yourself in a criminal case. A misdemeanor or felony charge is punishable by jail, community work, fines, or a combination of these options. Attorneys are trained to evaluate and determine the best options for their clients. Thus, an effective attorney representing you can assure that you have every opportunity to resolve your case appropriately. You are entitled to hire an attorney of your choice. If you cannot afford to hire an attorney, then you are entitled to a court-appointed attorney to represent you at little or no cost, in any misdemeanor or felony case. You do not have the right to a court-appointed attorney for infraction charges. Burbank Criminal Court outcomes always depend on specific details/applicable law of each case. All theft charges are serious. Grand Theft and Burglary are called "wobblers," meaning that they can be charged as felonies or misdemeanors depending on the severity of the circumstances. Jail time may be considered for these types of charges at Burbank Court. Even if you only are charged with Petty Theft, commonly known as shoplifting, at a minimum, you are facing a conviction for a crime of dishonesty, commonly called "a crime of moral turpitude." Such a conviction can prevent you from obtaining or retaining certain types of jobs, and impact other aspects of your life in a negative way. In addition, upon conviction, you are facing probation, possible jail, fines, and/or community work with such charges. Your attorney should look at all available resolutions when resolving your case. Many people charged with criminal offenses fail to appear in Burbank Court for their scheduled court hearings. Unfortunately, there are significant consequences which generally follow. Judges typically issue bench warrants, with high bail amounts, for individuals not appearing in court on time. In the Burbank community, the Burbank Police Department is diligent in its enforcement of warrants, and it is not unusual for police officers to pursue people with local bench warrants. However, if you have a bench warrant, there may be effective ways to overcome the challenges you face, through the help of a skilled attorney. It is never a good idea to represent yourself if you have a bench warrant in a criminal case. If you are placed on probation in the Burbank Court, you are expected to carefully follow the requirements imposed by the judge. When you do not follow through, or violate terms and conditions of probation, the court will set your matter for a probation violation hearing to evaluate the extent of the problem. You are entitled to be represented by an attorney at the hearing. If you are found to be in violation of probation, you are subject to incarceration, revocation of probation, and/or termination of probation. Because of these serious consequences, it is wise to have effective legal representation. It is never a appropriate to attempt to represent yourself if you are accused of violating terms of your probation. Suspended driver's license cases typically begin: 1. after a failure to appear in court; 2. upon conviction for DUI or Hit and Run; 3. based on Driving with Excessive Blood Alcohol, or Refusal to Submit to a Chemical Test; 4. because of failure to pay child support; or 5. because of a Medical Condition which may prevent safe operation of a motor vehicle. Minimum sentences for suspended license violations range from fines of over $1200, to a combination of jail and fines, depending on the type of suspension and previous driving history. There may be effective ways to undo the underlying cause of a suspended license. An effective attorney will look at trying to resolve the situation from a "global" standpoint, in order for you to avoid future similar problems. A Hit and Run charge is a serious offense. Depending on whether there are injuries and the severity of the collision, a Hit and Run charge can be charged as either a felony or misdemeanor. Property damage Hit and Run cases are only charged as misdemeanors. The Burbank Courts treat these cases seriously. Penalties can range from incarceration, community work, fines, restitution, and probation (or a combination). Hit and Run case can sometimes be resolved with a Civil Compromise, or similar solution, when the victim of the case has been fully compensated for damages and does not desire prosecution in the case. An effective Burbank or Los Angeles Hit and Run Attorney can help determine the best possibilities for your case. Drug Possession charges should never be taken lightly. Felony drug cases can result in either state prison or county jail; misdemeanor cases can result in county jail. Any drug-related violation carries a negative stigma. However, there are effective approaches to many of these cases. The California Legislature and voters favor drug treatment, rather than punishment, for many drug possession charges, with options such as Penal Code section 1000, commonly known as drug diversion, as well as Proposition 36 Drug Court. People charged with any drug offense should be sure to seek legal representation to determine their best options. There are numerous arrests and citations originating from the Bob Hope (Burbank) Airport each month. Cases range from traffic citations, to Possession of Prohibited Items (Penal Code section 171.5), to Possession of Controlled Substances (Health and Safety Code sections 11357, 11350, 11377) and Possession of Weapons (Including Penal Code sections 21810, 21310, 25850, and 25400). Criminal charges at the airport are serious, and require careful legal analysis to determine the best approaches with each case. There are over 10,000 sections in the Burbank Municipal Code relating to a variety of violations, including licensing, building permits, businesses, fire hazards, and zoning, to name a few. There are a wide range of complexities related to the local municipal code. In many cases, an effective attorney can navigate you through the challenges you face when charged with a local violation. Again, this is not a situation to take lightly, since typical municipal code violations carry the same maximum punishments as do misdemeanor offenses- up to six months in jail and a fine of $1000, or both. If you are placed on probation in a criminal case, there may be opportunities to have the case terminated and dismissed in the future. (See our Burbank Expungement Attorney webpage) In some cases, a case can be terminated early, and expungement pursuant to the California Penal Code can provide a second chance in life. A diligent attorney will evaluate opportunities to terminate probation early. Once probation has ended, a Burbank or Los Angeles Expungement Attorney may file a motion to expunge the charges. There are many kinds of community service which can be ordered at the Burbank Courthouse. The most common forms of community service are Cal Trans and Graffiti Removal. Community service can be challenging to complete in a timely manner, however, Burbank Court will sometimes allow the work to be directed and monitored at another community service office. Most participants attempt to complete their community work on weekends. However, since most people participating in community service attempt to complete their community work on weekends, there is a shortage of work assignments. Thus, many people are turned away at the community service locations on the weekend. It is important to show up extremely early to make sure you are allowed to participate in the program each day. Failure to complete your work on time is considered a Probation Violation. Your attorney can explain the best strategies to complete your work on time. The Burbank Jail- Criminal- is located at 200 North Third Street in the city of Burbank. It is currently operational, and processes those arrested within the city limits. Those arrestees not cited out or bailed out, will remain in Burbank Jail until their court date, unless they need medical attention, at which point they are sent to LA County Jail for treatment and processing. Those arrested for misdemeanor violations in Burbank are usually taken to Burbank Court the next business day. Those arrested for felonies are generally taken to Burbank Court on the second business day. Burbank Jail offers a Pay-to-Stay Program, for misdemeanor cases where jail is ordered. Those with a Burbank Jail Felony are not typically eligible to remain in this facility. This Burbank Jail misdemeanor option costs about $100 per day. Additional requirements and arrangements for Burbank Jail sentences must be cleared through the Burbank Court and Burbank Jail. Those seeking Burbank Jail Inmate Information can call the jail directly at 818-238-3010.